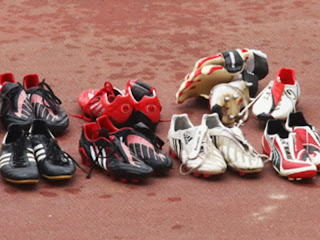 Raheny GAA operates a boot exchange aimed at juvenile players. The idea is that parents donate outgrown boots and find a pair in the next size. No money involved, so it's pocket and environmentally friendly. 9.30am - 12.00pm each Saturday in club shop. Q: I'm always on a sideline on Saturday mornings - is there any other means of accessing the boot exchange? A: Email rahenygaaboots@gmail.com to arrange alternative boot drop off or collection, or to enquire whether particular size is available. You can also drop boot donations into the Club Bar. Q: Can I pick up boots if I have none to donate? A: Yes, sometimes the old boots aren't in great condition, or your child is only getting started - you are welcome to pick up boots nonetheless. However, we ask that you remember the boot exchange if you have boots to donate in the future. Q: Does the boot exchange cater for teenagers? A: Absolutely. There are often size 9s and bigger in stock, this can be a period of rapid growth and players can move up several sizes in a matter of months. Q: My child has outgrown his/her hurling helmet - can I donate it for reuse? A: Hurling Ogra would be delighted to accept any old helmet, even ones with broken clasps etc (they can be fixed). Contact Seamus Dunne on 087 2515524 or drop down to Hurling Ogra on Friday nights.